Stampin Up’s Sale- A- Bration is in full swing and today’s card is featuring products from the Sale- A- Bration catalog. This years Sale- A- Bration features 13 all new items plus 6 items from the Stampin Up annual catalog. For every $50 in product sales you will earn 1 item from the Sale-A-Bration catalog for FREE. Plus during Sale-A-BRation, for an order of $150 your will get 3 items free plus a pack of Silver Glimmer paper for a free bonus and of course the $25 in Hostess dollars to spend as you wish. Hurry because Sale-A-Bration ends on March 22 and there is no limit to the number of free items you can get. 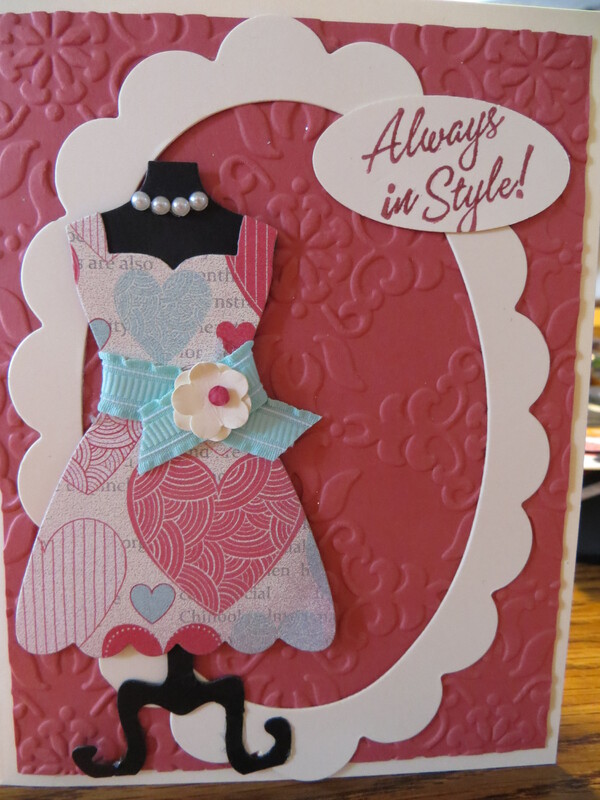 Cammie’s card uses the Vine Street textured embossing folder #130492 as the background. She then matted and layered the Sycamore Street DSP #127540 on Island Indigo. She then used the Madison Avenue stamp set #129657 and her Stampin Up markers to make the focal flower and then matted that on Summer Starfruit. Not to be out “cute-ed” Cammie used the Pretty Petites #129639 and the even cuter co-ordinating Petite Curly Label punch #129405 to add the card greeting. Yes everything on this card was free (except the cardstock and ink)! Don’t let the sale-abration pass you by. Place your order today! This card is another one that I created using the Dressed Up Framelits #131095 and a Paper Doiley #129399 from the Stampin Up Spring Catalog. 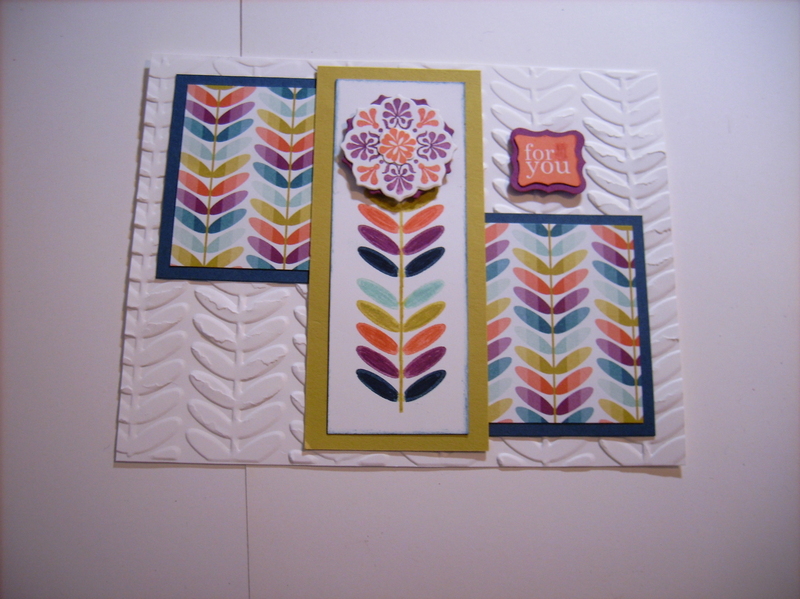 The card base is very vanilla and then I did a whisper white Vintage card front with a peek-a-boo cut from the Labels framelits. I added the black mannequin and cut the dress from whisper white left over by cuttiing the hole. I adorned the dress with mini pearls and then folded the doiley to make the skirt. I added a pool party belt and flower madefrome the new 7/8 ” mini scallop circle punch. I added the sentiment congratulations…. all dressed up and somewhere to go from the coordinating All Dressed up stampset #129174. I am in love with these dresses and am thinking I might do an all dressed up workshop. The possibilites with this set is endless. Happy Birthday to my sweet and pretty friend Debbie Mason. Debbie is definately one the sweetest people I know. She is as pretty on the inside as she is beautiful on the outside. She is always put together and very stylish. 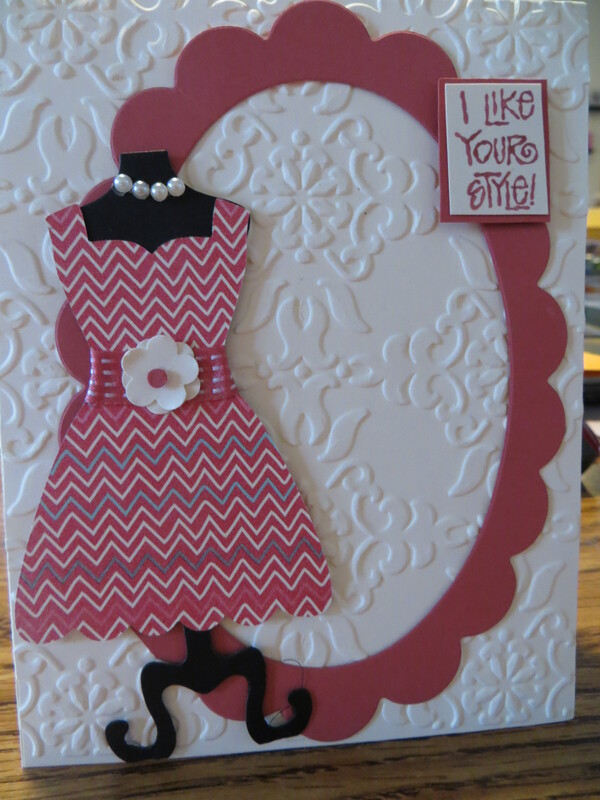 So today’s card is one that I made for her using the Dress Up Framelits #131095 and the More Amore DSP #129309, both from the Stampin Up spring catalog. I textured the primrose petals background cardstock using the Vintage Wallpaper textured folder #120175. The scallop frame was cut using a retired die. The mannequin is cut from black cardstock and then I added pearls at the neck. The dress was added and tied with a piece of pool party ruffled ribbon and a flower at the waist. I love the sentiment on the inside of this card. It says, Happy Birthday to a special someone who is always in perfect form. 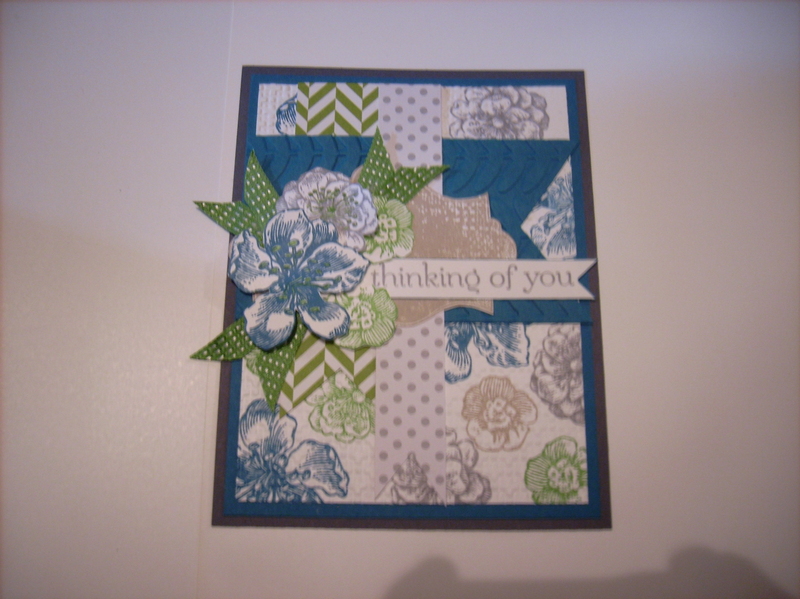 The sentiment is from a now retired Stampin Up stampset called I like your style. That sentiment says it all. Hope Debbie has a perfect day! 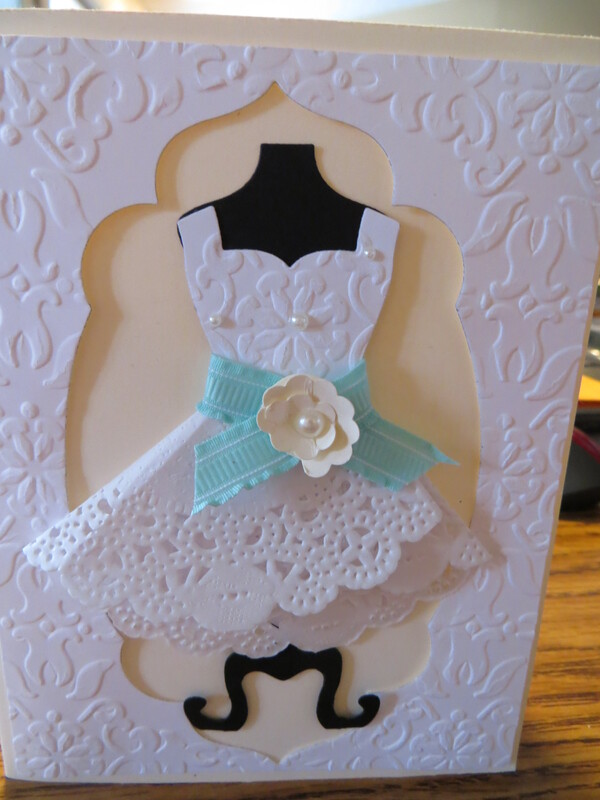 As a bonus, I created the same card but switched the Dress DSP and the sentiment. Super cute. Today’s card is one that looks way better in person than in the picture. This card was designed by Cammie using Stampin Ups Everything Eleanor stamp set #124164. I love the color scheme that Cammie chose ( Crumb Cake, Island Indigo, Gumball Green and Basic Grey. Cammie created her own background paper by stamping images from the Everything Eleanor stamp set and then began layering DSP and cardstock banners and framelits. The flower cluster was done by stamping the floral images in coordinating inks. Cammie cut the flowers out and then began layering and popping them to create a beautiful cluster. After seeing what Cammie did with the Everything Eleanor, I have decided to add it to my Wish List. The weather in Ohio this year has been way different than the global warming winter we had last year. We have actually had snow this year but much to my son’s chagrin there have been no snow days! As for me I think the snow is pretty but after the first snowfall it needs to go away until next year! Today’s card is simple and I used it for some of my winter birthdays this year. The crumbcake cardstock is layered with a strip of whisper white cardstock textured with the Fancy Fan Textured folder #127751. I then layered a piece of bashful blue cardstock cut into a banner and pierced with the piercing pack #126187. 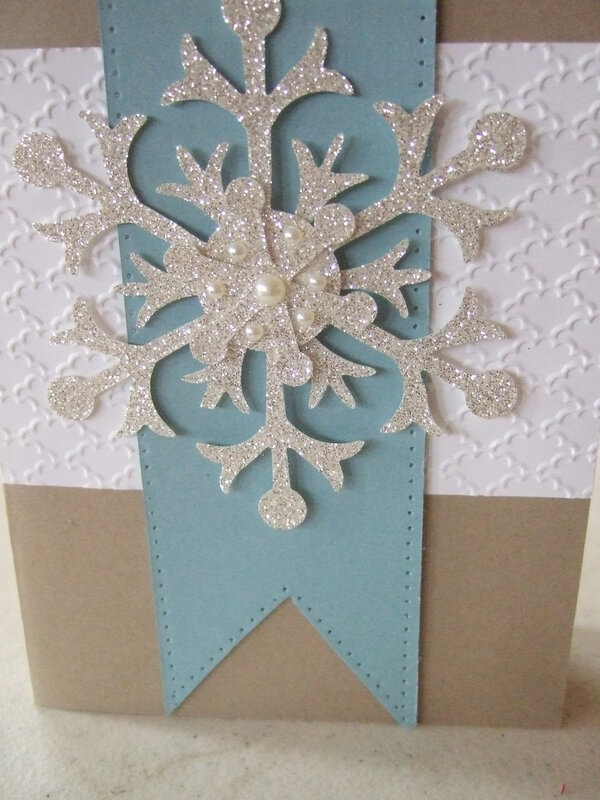 The snowflakes are cut from the silver glimmer paper #124005 using the Snow Flurry die #127813. The snowflakes were stacked and then embellished with basic pearls. Happy Birthday to my neighbor and dear friend Lynne. Lynne is an avid seamstress and I always make her a sewing related card. I think I collect way too much sewing stuff because I would love to be able to sew. In fact when I grow up and retire, I plan to take sewing lessons and quilting. Oops, I am gettiing off track. When I received the new Stampin Up Spring Catalog I fell in love with the All Dressed Up stamps #129174 and the coordinating Dress Up Bundle #131095. The background DSP is from the fabulous Print Poetry DSP Paper Pack #129312. How cute is the sewing related paper? I also cut the dress and apron from thie Printed Poetry workshop. I pieced the apron to the dress and then hid it with a piece of primrose satin stitched ribbon and added a flower at the waist. The dress was added to the manequin that was embellished with pearls. 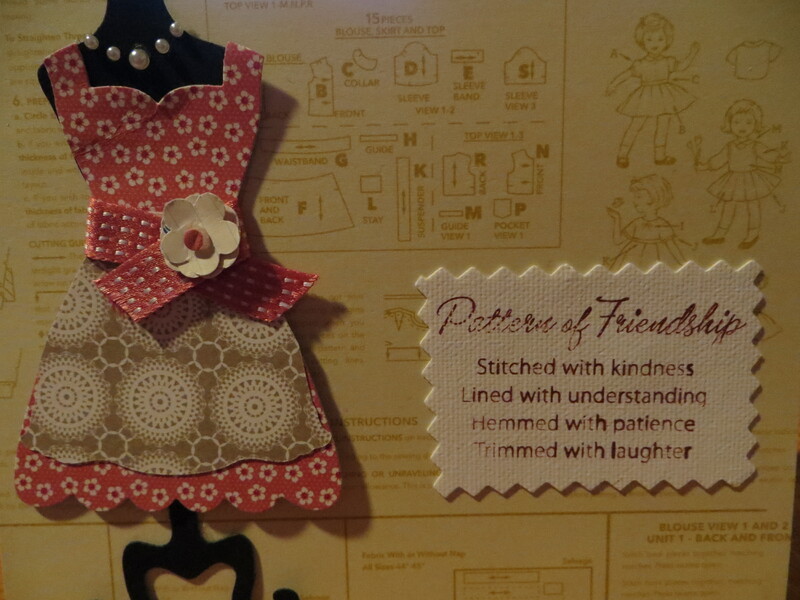 The sentiment is from a retired Stampin Up set called Pattern of Friendship. I stamped the sentiment on a piece of the Canvas Creations sheet. I then edged the canvas with pinking sheers. I love this card and know that Lynne will too. Warning….. I am obsessed with this die so there are many more dress cards forthcoming. I am thinking it is related to my paper doll obsession from my youth. For the last several months, we have posted a Christmas card on the 25th of each month. This was so popular and believe it or not we did not post all the cards we made this past Christmas so we have decided to carry the Christmas card posts in the 25 for all of 2013! So forgive me if you are Christmas-ed out! Today’d card features the Be of Good Cheer DSP #126896 from the Stampin Up annual catalog. 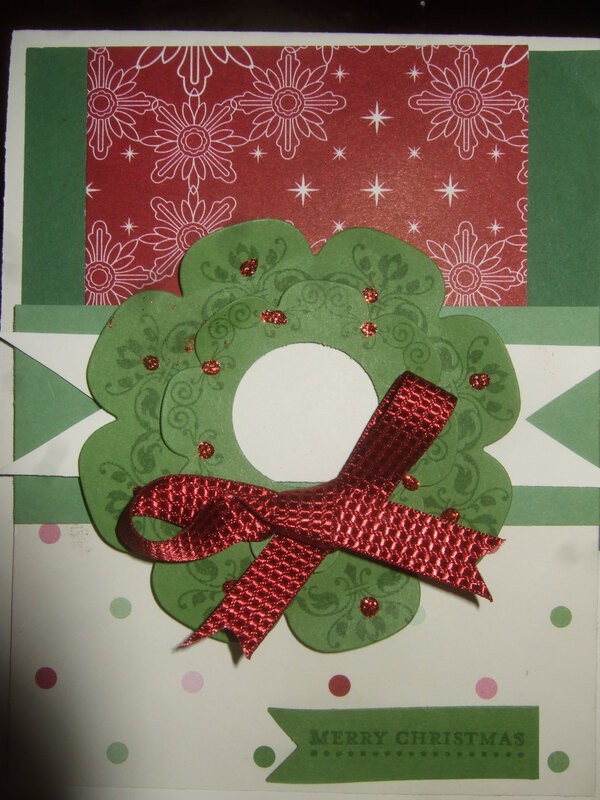 To make the wreath, I thought outside the stamp and used the Day Dream medallion set #126467 and coordinating Floral Frames Framelits #127012. I finished by adding a bit of Cherry Cobbler Dazzliing Details #125585. It was quick and easy (after the Dazzling Details dried).